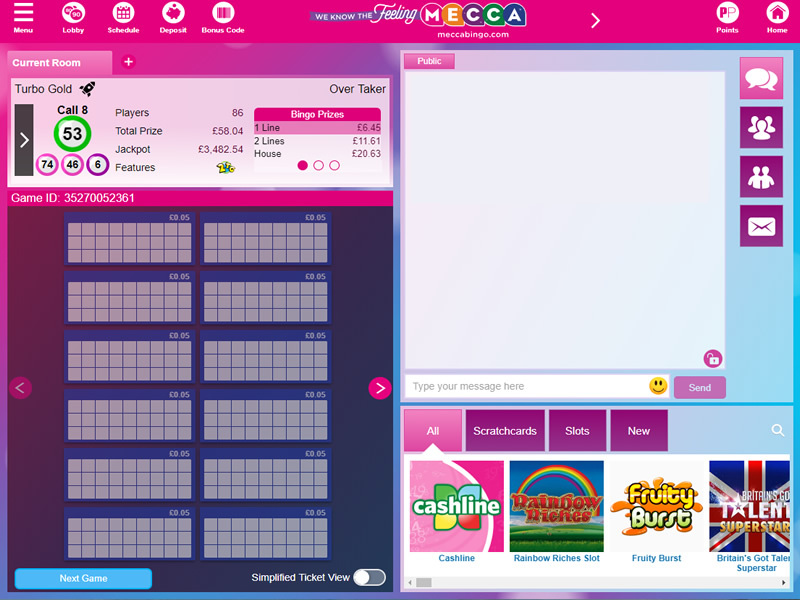 Play online bingo at Mecca Bingo, the Number 1 UK bingo site & get a 400% sign up bonus! Plus get £10 free to use in any Mecca club! Huge guaranteed jackpots, Daily Promotions & more! Official X-Factor Sponsor. X-Factor Bingo Room plus Free Bingo for Newbies! Love those big-grin moments? We’ve been around for over 50 years, so we know the feeling! With us you can enjoy that spend-£10-play-with-£40 feeling too as well as 20 free spins. 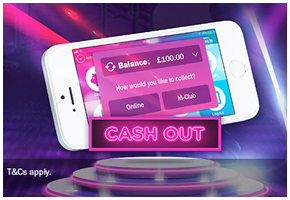 • You’ll then be able to play with £30 online and get £10 to use in any of our clubs. You also get 20 free spins for Cleopatra, so if you’re more into our sublime slots selection simply head over and open the game to start spinning on us. Has your lucky charm worked its magic? If so, you can collect your winnings in your local club if that’s what suits you best – and you can make a deposit there too. 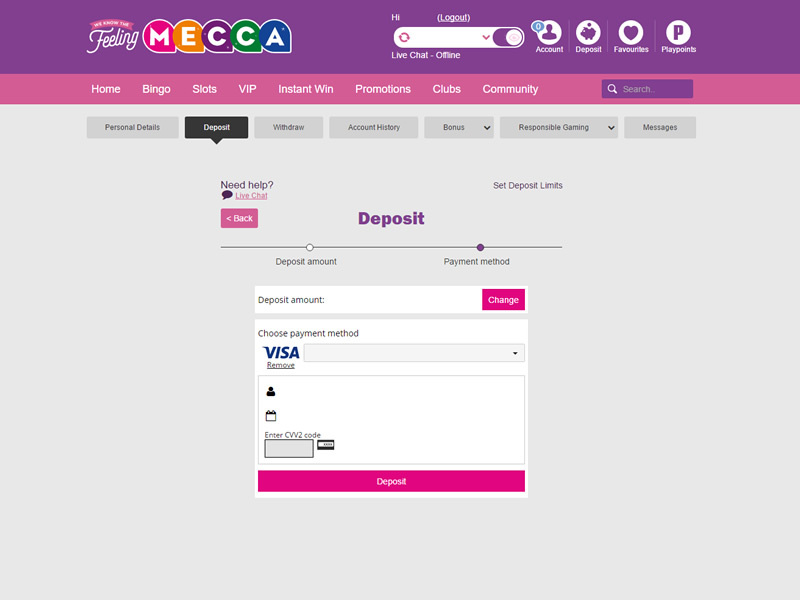 If you’re cashing out you can make 1 withdrawal a day that’s between £10 and £100 from any Mecca club. You just need to call 0800 083 1988 FREE between 10.30am and 9pm to make an arrangement to pick up your winnings. 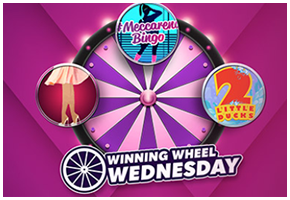 Spin the Winning Wheel every Wednesday! Take a spin on the Winning Wheel every Wednesday to share in prizes galore with your fellow Roomies! With hourly spins of up to £150 and some wheely fun mini-games to enjoy, this weekly event is not to be missed — set your clocks and save the date for our Winning Wheel Wednesdays! Play Winner Spinner every day for FREE. Click ‘Go’ to spin the wheel for your chance to win a daily prize. Don’t forget to come back tomorrow! 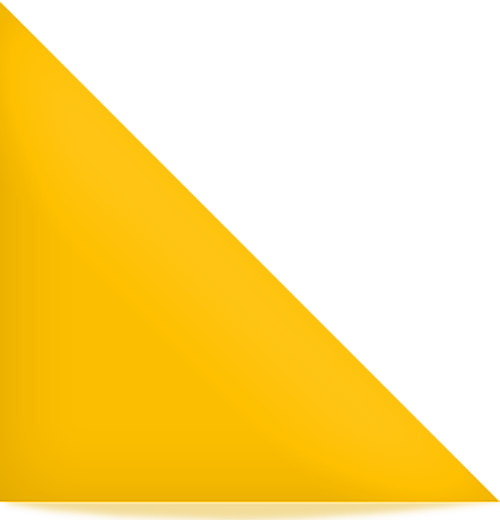 Mecca Bingo is one of the biggest and best bingo hall operators in the Country. Founded in 1961 they now have an excellent online offering covering Bingo (Mecca), Casino & Sports(Grosvenor) . The colourful graphics, easy to use website and 24 hour a day online games make it a must visit for all bingo and game lovers. 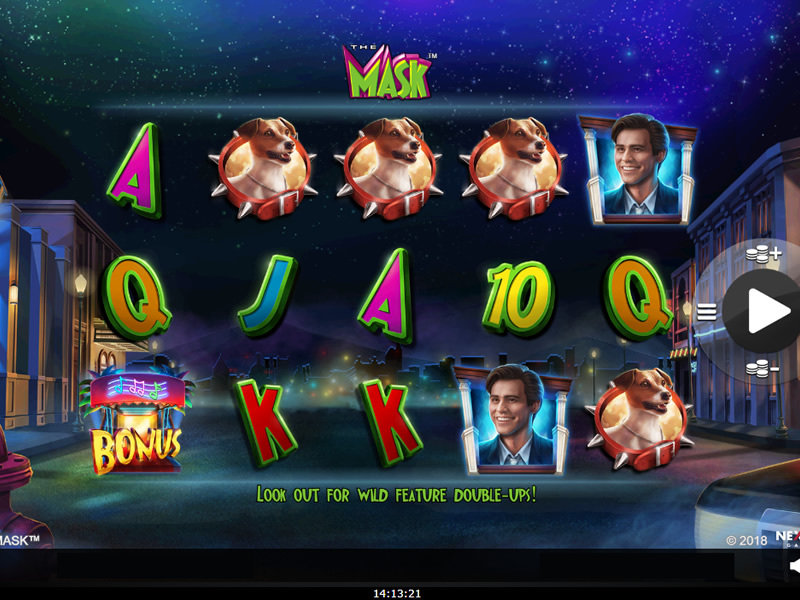 They have huge guaranteed jackpot payouts and a fully moderated chat room. Mecca also operate over 100 land based bingo halls throughout the UK, so you know you are in safe hands. Their online offering is one of the largest bingo websites in the UK. 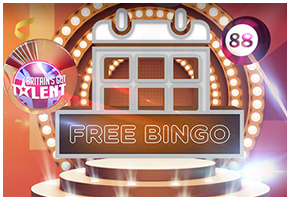 They have thousands of active players with dozens of bingo rooms to pick from, Our exclusive Britain’s Got Talent and The X Factor Bingo games are perfect if you love the smash hit shows. Or if you fancy taking part in some classic game show, we have Blockbusters bingo and Deal or No Deal bingo games, too! 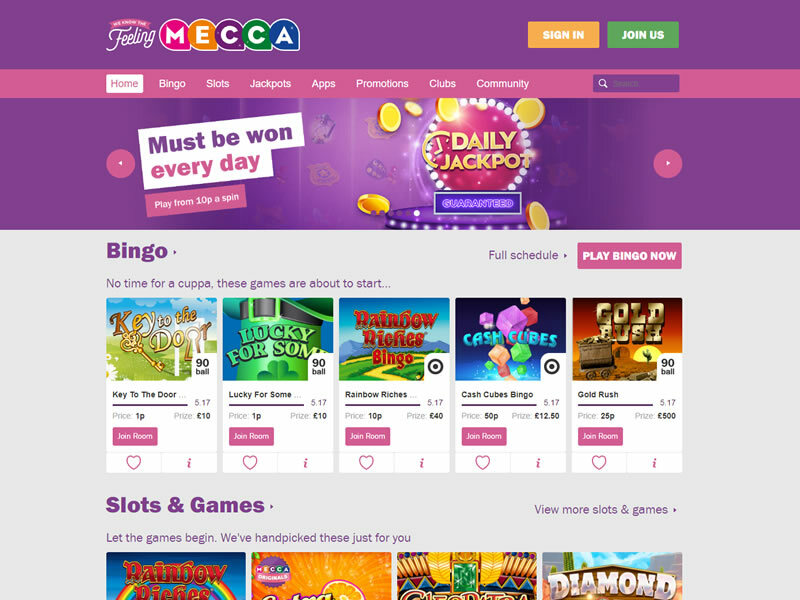 Along with the standard 90-ball bingo, Mecca have a variety of unique bingo games for you to try, from games designed around Deal or No Deal and Britain’s Got Talent to Superbooks in their Club Bingo room. Great community, feel at home with the mecca family....highly recommend. I found Mecca Bingo to have a good payout and loads of options for bingo and slots. newbie room is so busy no chance of winning but bonus is solid!!!! My car is on its last legs i could do with a New MINI, come on i deserve a bit of look after the year i had.........I LOVE MECCA!!!! Who is ready for all the huge prizes to be won over xmas?? 😁 Come on santa bring us some luck, its not only the kids that love xmas! I like the chat here, perhaps not the best looking bingo site out there. They have great 90 ball games each day sometimes with huge jackpots plus ever changing promos. Free Bingo - Ill be Joining uptoday make the most of it! When is Mecca moments coming back, i love all the prizes? they never give you any bonus! Also they ate my dog!Bad news that. 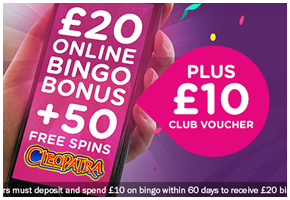 New customers must deposit and spend £10 on Mecca Bingo within 60 days to receive £30 Bingo Bonus with 2x wagering requirement. Further Terms Apply.